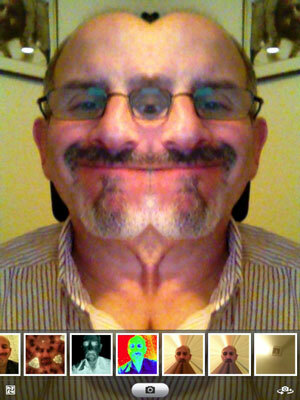 In the Photo Booth app included on the iPad 2 and third-generation iPad, Apple has cooked up a modern alternative to a real photo booth. Photo booths (which do still exist) are fun places to ham it up solo or with a friend as the machine captures and spits out wallet-size pictures. 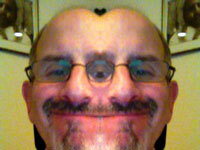 1Tap the Photo Booth icon. A red curtain opens, revealing the tic-tac-toe-style grid. 2Point the front-facing camera at your face. 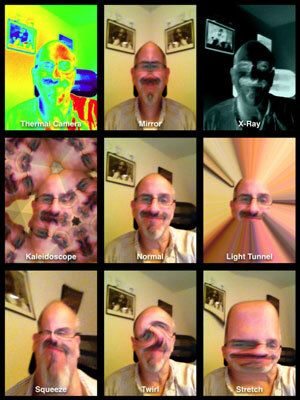 You see yourself through a prism of eight rather whacky special effects: Thermal Camera, Mirror, X-Ray, Kaleidoscope, Light Tunnel, Squeeze, Twirl, and Stretch. The center is the only one in which you come off looking normal. 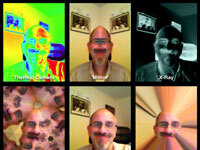 You can also use the rear camera in Photo Booth, to take pictures of your friends. 3Choose one of the special effects (or stick with Normal) by tapping one of the thumbnails. The user chose Mirror for the example shown. 4If you’re not satisfied with the effect you’ve chosen, tap the icon at the lower-left corner of the app to return to the Photo Booth grid and select another. You can choose another effect. 5(Optional) After choosing an effect, doctor things up even further by pinching or spreading with your fingers. Play around until you get an effect you like. 6When you have your bizarre look just right, tap the shutter release on the screen to snap the picture. Your pic lands (as do other pictures taken with the iPad cameras) in the Camera Roll album. From the Camera Roll album, pictures can be shared or — you might want to seriously consider this given the distortions you’ve just applied to your face — deleted.